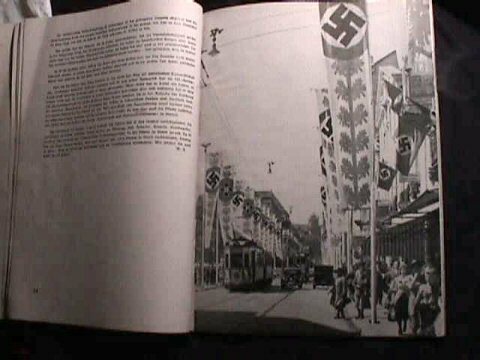 DESCRIPTION: The Kyfauser Verlag in Berlin published this book in 1939. 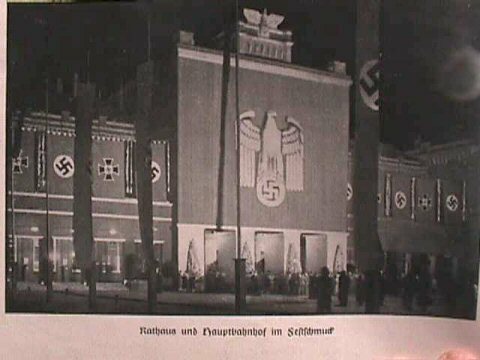 The 24 pages of text concern the organization and this celebration that was so vastly important to the Third Reich. There are 55 pages of some of the finest Hoffmann photography ever produced; absolutely stunning. Measuring 8 ½ x 11 ½ inches this book is soft covered and in remarkably good condition. Some of the pages have from 3 to 10 pictures. 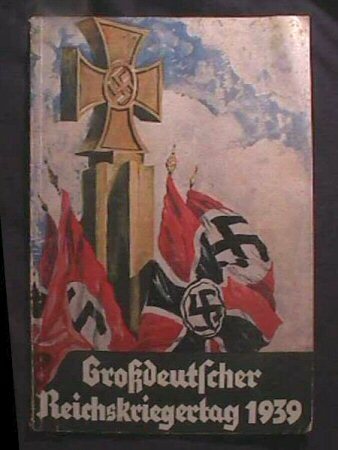 This is an offering of a very rare and ultimately great book of the Reich's military experience. 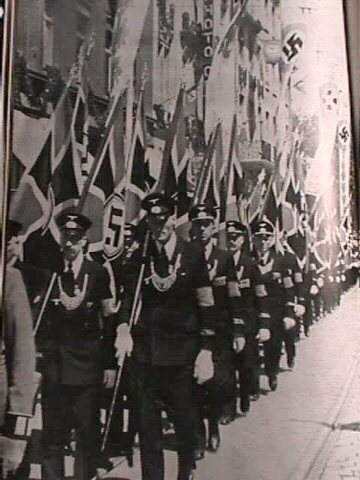 It was the support of the leagues of ex front-line soldiers that helped immensely to support Hitler's regime. This is very historically important. 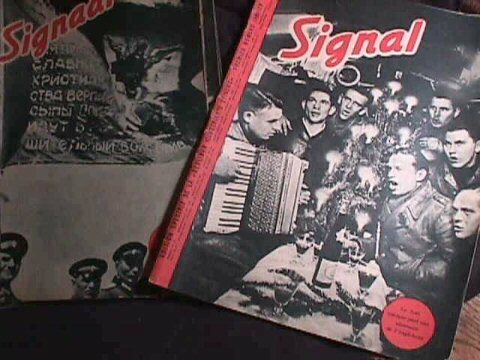 DESCRIPTION: We have several Signal magazines; some in the Dutch language and also ones in French from 1941, 1942, 1943, and one rare 1944 issue. 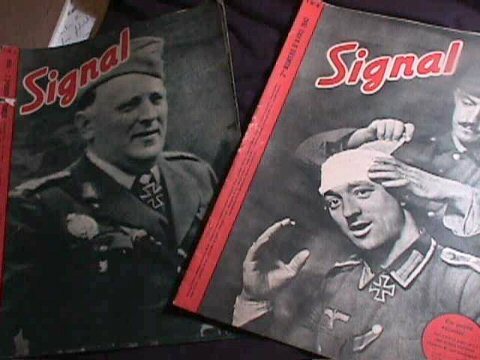 For those familiar with these great Third Reich military-inspired magazines you know they are loaded with great WWII pictures and they were the first to include living-color photography on a full-time basis. The pictures and process were far ahead of their time. They are in various stages of condition, but are mostly very intact and good. 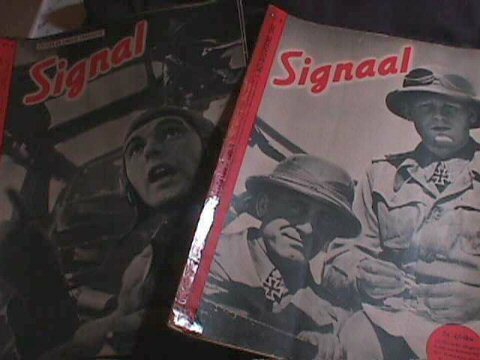 They are large magazines measuring 10 ½ x 1 ½ inches. DESCRIPTION: This particular painting is even now in the research stage and may be considered ultra-rare and very historically important. To the quick observation it may seem that we have a German general, but on deeper examination several unusual items come to the fore. 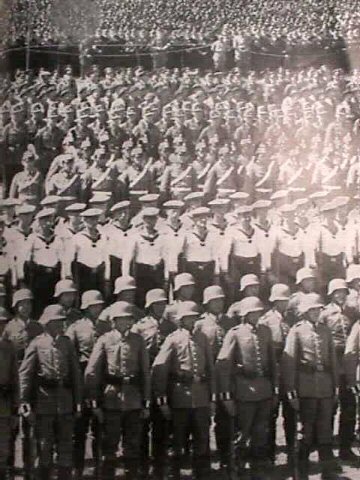 One is the high collar peculiar to the WWI tunics. Also, what is seen is the 1933 date (when it was painted). 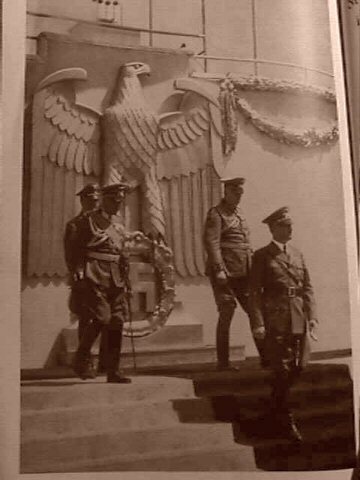 Take the fact that the general is wearing the basically WWI tunic with the Nazi breast eagle would indicate that he was possibly not in the Fatherland proper when the uniform was changed. Where was he? We propose he was in India working at training Indian troops while in full cooperative efforts with Subhas Chandra Bose, who was the founder and leader of the Azad Hind (Free India) Movement. 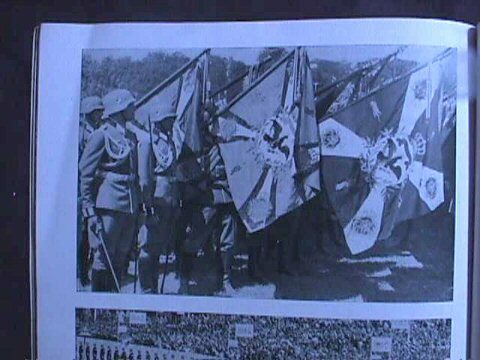 This was at that time in 1933 known as "The Indian Liberation Movement." 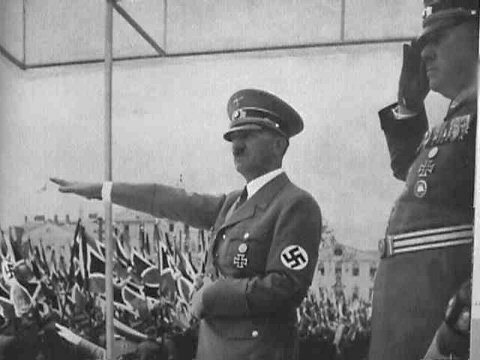 The German chancellor, Adolf Hitler, elected in 1933, has been described as one of the most politically and geopolitically astute men of the 20th century. He had visionary powers almost beyond human comprehension. We believe that this WWI general, whoever he was, might have been immediately dispatched to India with the express duty of bringing the Azad Hind Movement into the eventual German agenda of supporting the Japanese and crippling the British forces in that part of the world. As was with many other Far East objectives in mind, the far-reaching goal was to enlist the whole of India and Japan in the necessity of the invasion of Russia and the victory over the Soviet menace. We know that Germans had worked with Bose even before this because their anti-British (Churchill) stance was as heated as the Indians in their cause. Now why do we know that this particular general was an important Indian associate in the great struggle? 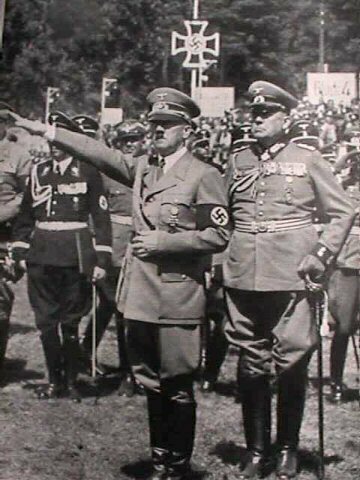 Look at the huge order at the neck of his tunic and lo and behold you see the early form of the Azad Hind, the order presented to Indians who offered their services to the government of the Third Reich. This was an award of the India Freedom Movement as late as 1944.
Who is this general? 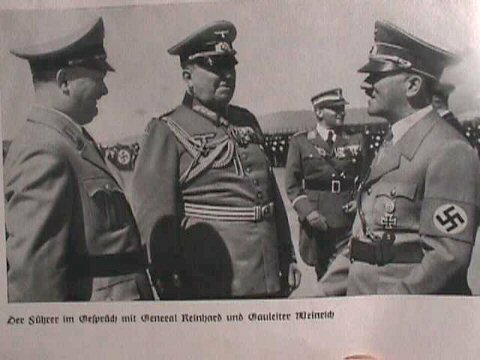 We have the names of several members of the German General Staff, who worked alongside of Chandras Bose in these gallant efforts: Keppler, Nambiar, Werth, and Adalberft Seifrits, but the man who was directly assigned to the strict training of the Indian recruits was a lieutenant colonel name Krape. 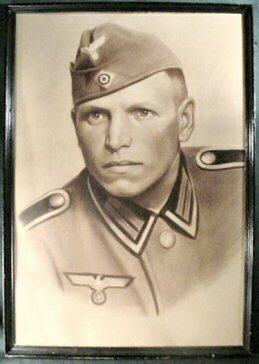 He was considered the German commander of the Indian Legion. 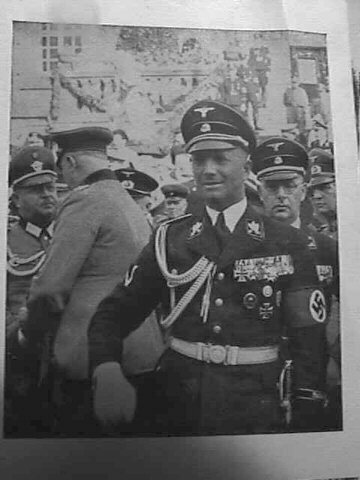 Could he later have been promoted to general? So here we have the mystery. 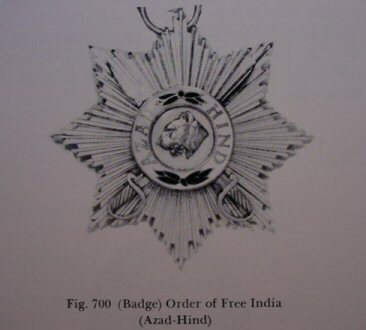 It is for sure that the highest order of the Azad Hind was not worn by many, if any, higher-ranking German officers. Does this narrow it down? Do you have any helpful information to add? 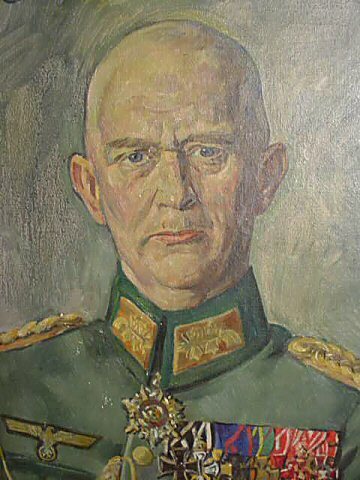 The painting is well done of a very efficient and strict German officer (probably Prussian). There is some slight scraping at the bottom of the canvas under the adjutant cord. Otherwise, the painting is in rather good shape. With frame it measures 24 x 28 ½ inches. The actual visible painting measures 19 ½ x 23 ½ inches. The signature looks like "Emil Kase." Frame looks to be original. 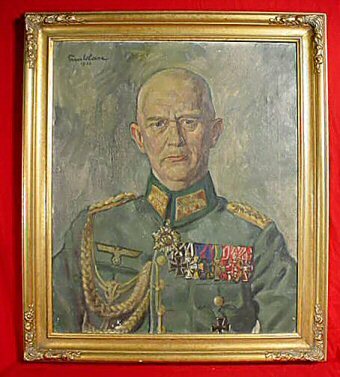 Well, we have a mystery, but we also have a fine historically important original canvas of a German general. We would say it is rare even in that sense and you can continue the search for the answers. To you, the challenge. 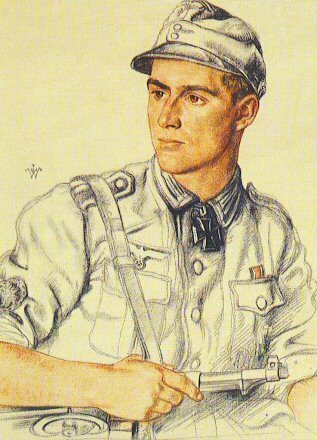 DESCRIPTION: These two pictures are original charcoal of a young German soldier pictured in the early Waffenrock (tunic). This is the work of a very skilled artist. The pictures are so fine you would expect them to breathe. 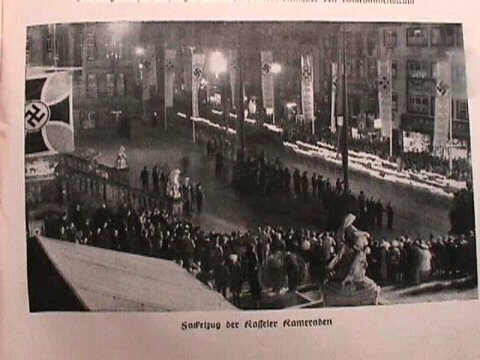 These are pictures that to some would inspire emotions of idealism and gallantry of a whole generation of young Germans, who lost to the overwelming power of production. Did this young man survive? Over 4 million of his comrades did not. 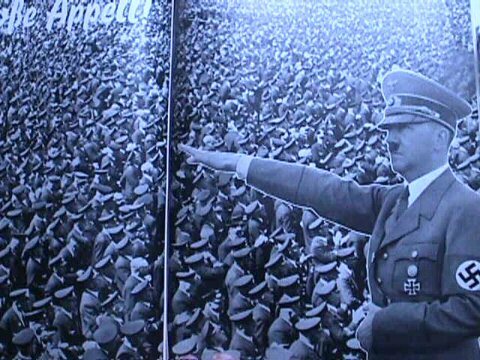 About a million died in "Ike"'s prisoner-of-war camps in the occupied Rhineland. 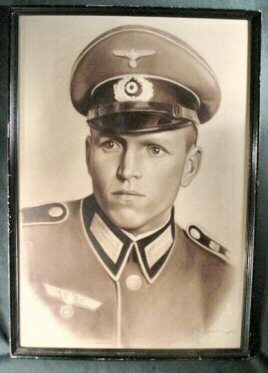 These are particularly fine renderings and we believe them to be fitting memorials to the soldiers of the German Wehrmacht. The frames with pictures each measures 21 x 15 inches. 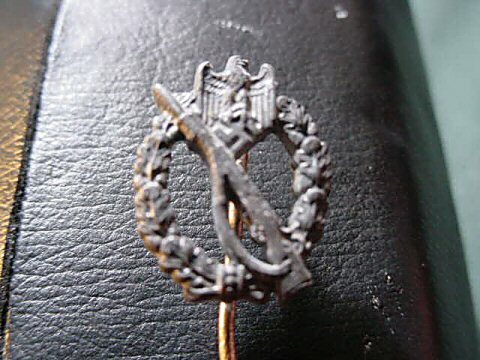 DESCRIPTION: This is worn by soldiers who have distinguished themselves in hard front-line fighting. This is worn on civilian clothing by qualified recipients. 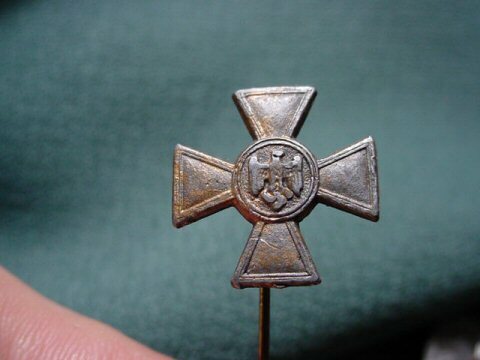 DESCRIPTION: This is an oversized stickpin for a soldier who had served the German Armed Forces for some 18 years. It has the circled 18 on the back. Well used, but still in fair condition. Has resoldered pin.